Chin augmentation inserts an implant under the chin to alter the jawline and improve facial profiles, and one common concern about chin augmentation is the worry that the alignment of the implant can be knocked askew. Luckily chin implants rarely slip! The problem with alignment usually happens during the surgery due to crooked placement of the implant. Regardless of the choices made by your surgeon regarding the implant, you will be wearing a chin strap for up to a week after the procedure. Your doctor will be the one to remove the dressings and sutures. DO: keep your dressings clean and dry until it’s time for their removal. After the dressings are gone, they may be replaced with fresh dressings or with steri-strips in place of the sutures. You will also have to maintain a level of cleanliness and dryness until they’re removed in 3 to 4 days. DO: keep your head elevated while you sleep during the first few weeks of recovery. DO: be gentle when you’re moving your hands around your face to prevent things from coming into contact with your chin. When it comes to medication, follow the instructions to manage your pain, but also make sure that you’re not trying to grin and bear discomfort — you’re allowed to feel better through use of pain medication under a doctor’s supervision. Stay hydrated and only consume liquid or soft meals for nourishment. Avoid strenuous activity and stay positive during this time. 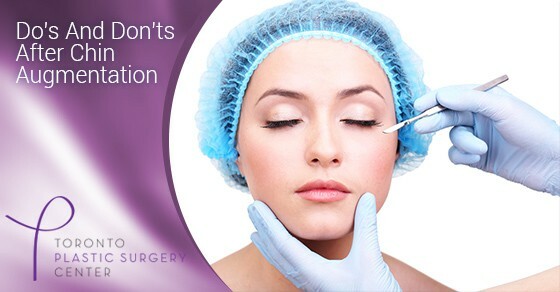 Start by following the instructions your surgeon has given you during your consultation prior to operation. Most people are happy with their chin augmentation and find their implants to be very sturdy after the procedure. If you have any further concerns, feel free to contact us by online or calling us today.